What a Fix-Up! 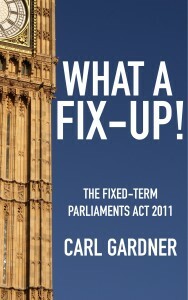 is my e-book about the Fixed-term Parliaments Act 2011. It tells you everything you need to know about the Act: what it says, its place in the constitution, the different ways it can be interpreted, and how politicians might use and abuse it in the 2015 Parliament. What a Fix-Up! gives a very quick refresher on the constitution (with a clear explanation of who’s appointed PM in a hung Parliament). After settting out the old system and telling how the rules were changed, What a Fix-Up! provides an in-depth analysis of the Act’s provisions, explaining the different ways it can be interpreted and the political implications of each of them, before looking at how the Act might be used and contested by politicians in three hypothetical Parliaments. What a Fix-Up! is not only the essential guide to the Fixed-term Parliaments Act, but a sharp critique and a passionate argument for repeal. You can buy What a Fix-Up! for Kindle here.